Free Shipping Included! Pack of 4 AED Practi-Trainer Essentials CPR defibrillator training units, WNL# WL120ES10-4 by WNL Products at Enria Industries. MPN: WL120ES10-4. Hurry! Limited time offer. Offer valid only while supplies last. This trainer is an affordable option for instructors, and the replacement pads are the same economical pads as used on the original Practi-Trainer. This trainer is an affordable option for instructors, and the replacement pads are the same economical pads as used on the original Practi-Trainer. This trainer is an affordable option for instructors, and the replacement pads are the same economical pads as used on the original. Beware of other economy trainers which cost a fortune to use! WNL's Universal Practi-TRAINER Essentials is designed to be a compact, easy to carry unit that still provides all the training functionality of larger models. It's even affordable enough so instructors can bring a unit for everyone in class! 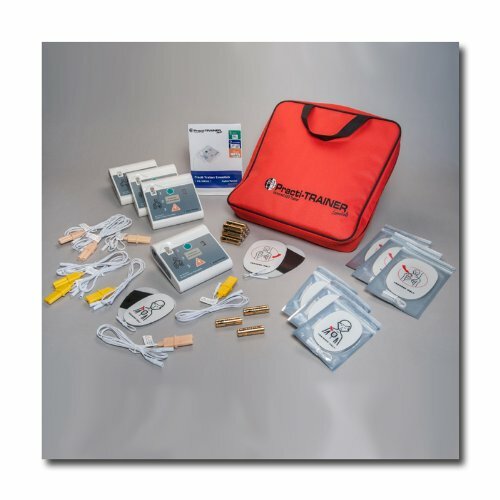 The Practi-TRAINER Essentials AED trainer offers a universal training experience that prepares students to use a variety of different AEDs. Clear voice prompts guide practicing students though the AED scenarios while the unit's metronome helps keep them motivated to push fast and hard for effective chest compressions. Fully compliant with the new 2010 ECC CPR guidelines, the unit is compatible with any type of CPR manikin that is intended for AED training. WNL's Universal Practi-TRAINER Essentials includes: 1 complete unit with 2 pre-programmed scenarios installed (each in English and Spanish), 1 set of child pads and connector, 1 set of adult pads and connector, 3 AA batteries, 1 manual, Zippered nylon-lined fabric carrying case with handle, and a 1-year manufacturer's warranty. If you have any questions about this product by WNL Products, contact us by completing and submitting the form below. If you are looking for a specif part number, please include it with your message.